To further validate their findings, we colonized the gut of mice with S. aureus and fed them B. subtilis spores to mimic probiotic intake. Probiotic Bacillus given every two days eliminated S. aureus in the guts of the mice. 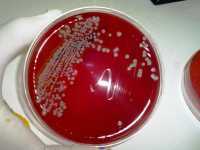 The same test using Bacillus where fengycin production had been removed had no effect, and S. aureus grew as expected. This is one of the first study that provide human evidence supporting the biological significance of probiotic bacterial interference and show that such interference can be achieved by blocking a pathogen’s signaling system. Response: The main message is that Bacillus-containing probiotics produce can comprehensively abolish colonization with S. aureus. It may be used for simple and safe S. aureus decolonization strategies. Response: One strategy to prevent Staph infections is to eliminate S. aureus colonization. However, some decolonization strategies are controversial because they require considerable amounts of topical antibiotics and have limited success, partly because they target only the nose and bacteria quickly recolonized from the gut. The success of S. aureus decolonization by probiotic Bacillus is highly valuable translational applications regarding alternative strategies to combat antibiotic-resistant S. aureus. Probiotic Bacillus can comprehensively eradicate intestinal as well as nasal S. aureus colonization. Such a probiotic approach would have multiple advantages over the current standard topical strategy with antibiotics, which is aimed exclusively at decolonizing the nose. Response: Based on our observation, we next plan to test whether a probiotic product that contains only B. subtilis can eliminate S. aureus in people. We will enroll more Thai volunteers for the project. We hope that Bacillus-containing probiotics can be simply used and safe forS. aureus decolonization and new ways to fight S. aureus infections. This entry was posted in Author Interviews, Infections, MRSA, NIH, Probiotics and tagged bacteria, medical research, NIAID, NIH, probiotics, staph aureus by Marie Benz MD FAAD. Bookmark the permalink.